What is BAFTA Rocliffe New Writing Competition, and why should you enter? Farah Abushwesha is a BAFTA-Nominated Producer, Amazon Best-Selling Author and a 2017 Screen International Star of Tomorrow. She’s also the founder of the BAFTA Rocliffe New Writing Competition, an initiative created to give talented fledgling screenwriters a headstart in the industry. 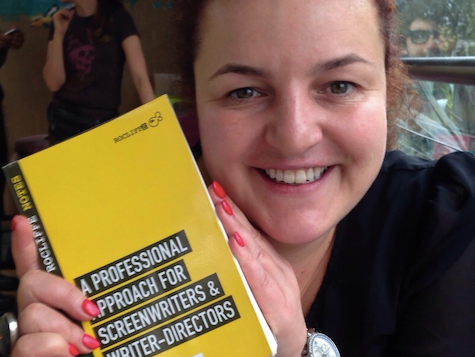 Actress, writer and producer Katherine Press sat down with Farah at BAFTA HQ to talk Rocliffe, filmmaking and her top tips for new writers. Katherine Press – Hi Farah, it’s great to see you. First up, what is the BAFTA Rocliffe New Writing Competition, and what does it offer the new writer? Farah Abushwesha – You too! Rocliffe was established because, as a young woman straight out of drama school, I’d been struck by how few scripts had parts for young actresses in their 20s. There was clearly a need for new voices, and voices from a more diverse range of backgrounds. So, it’s about creating opportunities for new writers with talent – whatever their gender, race, age, experience, etc. We hold four calls, four times a year, for TV Drama, TV Comedy, Children’s Media and Film. For each call, scripts go through an anonymous evaluation process, and then from a shortlisted selection, three projects are chosen to have their work showcased. That’s a great opportunity, because the room is always full – we have agents, producers, execs, the lot. A lot of them come along because they feel invested, and they like the idea of helping someone get started. Then there are the professional actors and directors who work on the finalists’ pieces, plus I like to get casting directors involved. KP – So it’s a good networking opportunity? FA – That’s part of it. The showcases are the centerpiece of Rocliffe, but even if you don’t want your work showcased, it’s simply a great place to come to talk about writing, to hear others talking about writing – writers, actors, directors – and that can be very inspiring. It’s also an opportunity to get yourself away from your laptop! Writing can be very isolating, and we get stuck in our heads for long periods of time without actually realising just how in our own heads we are. The other great thing is that you get feedback about your work. Writers learn how to take feedback – to take what resonates, and dismiss what doesn’t – and if you’re shortlisted, or receive some positive feedback, it gives you the confidence to keep going. Sometimes that’s all you need – somebody, somewhere, reading your work and saying “yes, this is ok, there’s something here!”. KP – What about the selection process itself? How does that work? FA – Entrants are judged on 10 pages of script. It’s fair, and pretty much anyone – any producer – will tell you that they can work out within two to three pages whether a script is working for them or not. That’s why we ask for your 10 best pages. Because it’s an anonymous selection process, nobody knows the age, race, gender or experience of the writer. You could be up against someone who’s written a few episodes of Hollyoaks, having never written anything yourself before. Nobody other than me ever knows the identity of the writer, and if for any reason anyone does, then they have to declare it and we work round that and give that script to somebody else to read. By removing the writer’s identity it puts everyone on equal footing. The scripts have to go through readers, then panelists and finally jurors, so they’re read a number of times. All entries are read by the readers, who come by recommendation – from production companies, or development courses. They make recommendations to the panelists (who are specialists in each of our four categories). In order to be shortlisted, a script must have been independently chosen – without conferring – by at least three panelists. The shortlisted scripts then go in front of the jurors. The judging is quality controlled at each level – there are guidelines that judges have to follow, and tests that they all undergo when they come on board. KP – What are they looking for? FA – When it comes to the jurors, they only receive the one-line synopsis and the 10 pages, so it’s judged purely on the quality of the scriptwriting. The idea doesn’t come into it. There are countless good ideas out there – 100% of the scripts submitted to us are good ideas – but it’s the execution of those ideas that matters. People can confuse a good idea with a good script, but there’s a massive difference. The mistakes writers make can be surprisingly similar. For example, when submitting to Rocliffe, it’s not great to have 10 pages that are all about setup. We want to see something exciting, something snappy. You need a good story and good work – but don’t ask me to define that! KP – Ok, I won’t! What would you say to people who don’t ‘agree’ with the idea of screenwriting competitions? FA – Don’t enter! I know what we can do for people’s careers, but if they’re not for you, don’t enter! KP – On that note, can you share some Rocliffe success stories? FA – People are getting representation, they’re getting their work optioned, they’re working on existing shows and their work is getting noticed. For example, Joanne Lau (2015 Finalist) was selected for the BBC Writers’ Room Comedy Room, and was featured on the BBC New Talent Hotlist 2017. 2016 Alumnus Ryan Brown signed with Independent, and his Rocliffe-winning TV series was also selected by Idris Elba and Lionsgate for their ‘Write to Greenlight’ competition. He also wrote for the BBC3 comedy Coconut, and his comedy series is in development with Hat Trick. Kayleigh Llewellyn (2012 Alumnus with writing partner Matthew Barry) is doing hugely well – she was a Broadcast Hot Shot 2016, has written on Casualty and Stella, was mentored by Abi Morgan under the BFI Flare Mentorship Programme, and has had multiple projects optioned with major broadcasters. She’s also got Creative England backing for her first feature film. KP – So the diversity aspect is paying off? FA – Rocliffe can’t do anything about diversity as such, because it’s an anonymous process. It just gives everyone an even playing field. Sometimes we have all male finalists, sometimes all female. When it’s all male, people shout about it, when it’s all female, no one says anything! But, when it comes to my own work and Rocliffe productions, I am hugely committed to diversity, and not just gender but age and race too, both behind and in front of the camera. Rocliffe’s first feature Irreplaceable You – which is a Netflix Original released on 16 February – was directed by Stephanie Laing and stars Gugu Mbatha-Raw, but the diversity was both in front of and behind the camera. You don’t notice anything different because you shouldn’t – it’s a good story well told. I’ve got a film in the edit with the actress Juliet Ellis – her first feature as a director – and Andrea Harkin directed The Party, which we were BAFTA-Nominated for. KP – You mentioned that one of your current projects as Producer is a Netflix Original film. How do you think Netflix and the rise of other online streaming giants are changing the industry? FA – We have three obligations as filmmakers – and by that I mean the writer, director, producer… We have to make the very best version of the project that we can. Firstly, we need to get it out to the widest audience and we need to make our funders proud, whatever the level of the project. So, if you’re doing a short and you have crowdfunders, it might mean ensuring that you get award attention at festivals, for example. What Netflix has done for my project is to take the pressure away from us, financially, and to guarantee that it will be seen by the widest audience. They are super supportive, have been amazing to deal with and we’re working as a team. With them, we ticked off at least two of those three obligations – the best version, and the widest audience. Hopefully our funders and backers will be proud too! When it comes the writer, it’s really about content. There’s a need for more content, so it creates more opportunities. Those big companies aren’t interested in the journey of the team – they just want good content – so your experience doesn’t matter. It’s not about your writing CV or your level of experience, they’re just after the best story. That’s a great thing, as a writer. KP – If there are bigger budgets with something like Netflix, does that in any way alter the experience or the approach of the writer? FA – I don’t think so, no. That’s the producer’s job. As a writer you shouldn’t be thinking about those kinds of things. I’m a massive fan of Jason Blum (Producer of Get Out, Whiplash and Paranormal Activity) and his thoughts on producing: find a good script that you love, and make it for as low a budget as you can. Asif Kapadia said “you’re looking for a cathedral but you find a tree”, and that’s it, really. Look around you at what you’ve got, and work with what you have. It forces you to be more creative. When I’m producing a project, I can work with the writer once they’ve told the story their way to reduce the expensive elements within the script. In my opinion it’s important that the writer doesn’t just deliver the script, but is part of the whole process. On the four features I’ve worked on, bar one – because the writer was based overseas – the writer has been on set. KP – What do you look for in a script, as a producer? FA – With Rocliffe productions I only work with female and diversity talent, although I wear that definition as loosely or as tightly as I choose! I look for something that gets me excited. I have producing partners – Rachel Lysaght and Lindsay Campbell at Underground Films in Ireland – and we tend to compare notes on all projects. It might not be the script, it might be the team behind the project, or the cast attached – the whole package. Something that makes it stand out and grab your attention. Or, it might be because we feel we can bring something to the project. I don’t know exactly what I’m looking for, but I know when it’s there. KP – What about your own writing? Being so busy with all your different projects, how do you approach that? FA – I’m currently working on two things, both of which are very personal stories. As a producer, I love what I do, but I suppose I sometimes feel guilty that I can’t find more time to write. Then again, I’m constantly writing submissions and applications, and that’s a form of writing in itself, of course. It requires a different part of the brain perhaps, but it’s still writing, and it’s still creative – the synopsis, development strategy, producers’ notes, the look, the style, the feel of the project… People forget that that part of the process is as equally valid and worthy of spending time on as the script itself. It goes back to what we were saying about competitions. It’s a really crowded place out there, and every time you submit your work you have to do everything you can to make your work stand out. So the process of working to a deadline, summarising your story in 25 words and putting together a one-page treatment is a hugely valuable experience, and your projects can only get better and better. But, when it comes back to the writing itself, what I most enjoy is the freedom it gives you. I’d like a bit more time to spend doing that! If I do need to do some deep focusing, I’ll go to the British Library or somewhere like that to really get stuck in. KP – I’m going to challenge you now! Do you have 10 top tips for breaking into the industry as a writer? FA – I’ll do my best! 1 – Enter the BAFTA Rocliffe New Writing Competition! And don’t just enter. Come along and meet people. 2 – I don’t know if “breaking in” is the right way to go about it. A writer needs to write, first and foremost, because it’s not just about writing once, is it? It’s about committing to a career, not a single script. It’s something that comes up again and again in my book, Rocliffe Notes – to be a writer you have to write, all the time, and not just deliver a single piece of work. 3 – There can also be an odd idea amongst new writers about ideas being stolen. Ideas are in the ether, so use them or lose them. If you don’t, somebody else will. Look at how many films we’ve had recently about Churchill, or the Second World War – they’re all different films! It’s not like we’re seeing the same retelling over and over again. Most horror films could probably be boiled down to a small range of horror tropes! 5 – Think about making shorts. There’s no reason why you can’t pick up a phone and film something yourself. If there’s a will there’s a way. 6 – A safe space for a writer isn’t just in front of their screen. Talk about your projects, talk about other people’s projects – actually get out and talk about them. Set up your own network or writing group, anything like that. 7 – That said, I appreciate not everyone is built to network, go out and tout themselves. But, you do have to do some groundwork. You have to find some way, otherwise how is anyone is going to find you? People talk about agents as if they’re the be-all and end-all. My agent negotiates my contracts, but most of the time I’ve got myself the work! You have to be proactive. It’s your work and your career. You don’t have to leave your room if you don’t want to, but there are still ways of informing yourself. You can Google, you can watch and you can research. 8 – Go on courses. We have a very different attitude to all that over here in the UK than they do in the USA. Having spent six months over there, even the top actors attend classes, and you get producers, directors and writers going to acting classes and improv workshops. Even if it’s not entering competitions, go on courses and flex your muscles. 9 – I’m a big believer in keeping busy and having lots of things on the go. I’ve produced four feature films. I worked my way up as a Production Coordinator, a Production Manager and Line Producer. That’s alongside the writing and working on Rocliffe. In order to do that, you have to know how to manage your time, and what to do when. I have three notebooks full of lists and notes in which I record everything – and I mean everything – about every project and every job. Throw yourself into everything you do, but be organised! 10 – Enjoy being a newbie! It’s great. You’ve got the whole world ahead of you. I sometimes wish I was still a newbie! One day you wake up and realise you’re not the new one any more, but the one giving advice. You can sometimes miss being new then. KP – Incredible. 10 fantastic pieces of advice! Any final thoughts you’d like to share? FA – Fill yourself with ideas. I aim to read at least one book a month, but I’m also watching lots of films and TV. Finally, try to be as effective as possible. Even if you’re working around a full time job, use your lunch hour – go for a walk, watch people and get character ideas. You can be a full-time writer even if you have a full-time job. KP – Wonderful, Farah. Thank you so much for taking the time to speak with me!